Anna Edel (‘19) drives the ball to the net in the game agaist Simpson. Women’s Basketball won their semifinal game of the Iowa Conference tournament 84 – 61 against Simpson on Thursday Feb. 22. The Iowa Conference Tournament determines which team advances to the national tournament and is separate from the final IIAC standings. Prior to the conference tournament Luther finished second in the IIAC winning 12 of their 16 games, behind Wartburg. Simpson finished sixth in the IIAC. 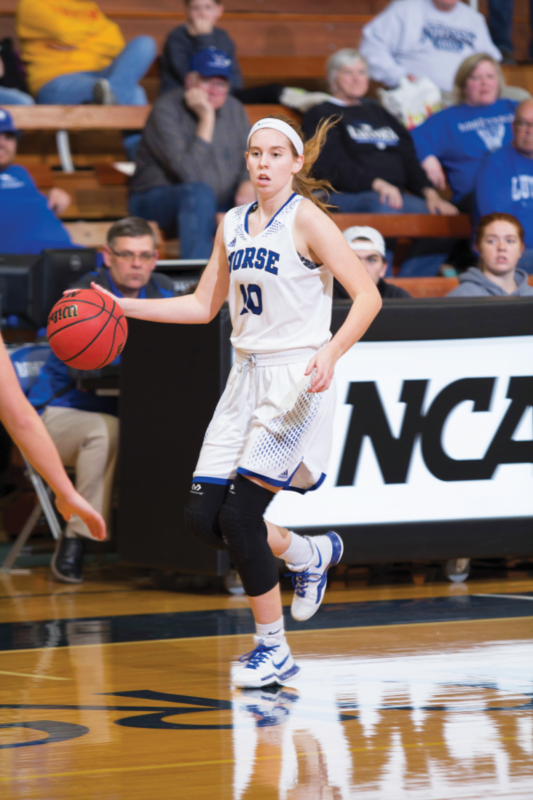 From the start of the game the Luther Norse led, scoring 19 points in the first quarter to Simpson’s 8. After the game, Head Women’s Basketball Coach Amanda Bailey emphasised the importance of starting off strong. By the half, Luther lead Simpson 43 – 23. According to Sydney Rehnelt (‘18), Simpson performed well later in the game; she agreed with Bailey on the importance of starting off strong. Luther beat Simpson in a game earlier in the season. Bailey was hesitant to anticipate an outcome prior to the game, but did leverage her understanding of the previous Simpson game when creating a game plan. The final quarter of the game saw the greatest number of points scored as Simpson tried to make up lost ground. However, their efforts proved unsuccessful. The game ended 84 – 61; Luther. Sarah Holtz (‘20) led Luther in points scored with 18 followed closely by Katie Waller (‘18) with 17 points and Laura Hamilton (‘20) with 12 points. In the final game of the Iowa Conference Tournament, two days after the Norse’s victory over Simpson, Wartburg defeated Luther in Waverly, Iowa 86 – 74, advancing Wartburg to the Division III National Tournament. Bailey looks forward to next season, emphasizing the challenges the team overcame this year.